Brussels sprouts have a bad reputation, mainly because they are often served after being boiled into a squidgy and disgusting mess. It doesn’t have to be that way! Here a way to serve crisp, tasty sprouts with the added bonus of Christmassy chestnuts. They look and taste great and you might even convert some people to loving their sprouts. Peel the tough outer leaves from the sprouts and cut off the stalks. Cut them in half. 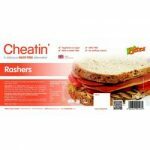 Cut the vegan bacon rashers into thin, short strips. Heat a knob of margarine in a frying pan and add the chestnuts, sprouts and bacon. Fry for around 5-10 minutes until the chestnuts and sprouts soften and start to brown. This is a great centrepiece for a special meal and it’s really easy to make. 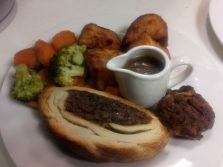 Delicious served with roast potatoes, vegetables and gravy. The ingredients are available from The V Spot. Preheat the oven to 200℃ / Gas Mark 6. Chop the onions and garlic and roughly slice the mushrooms. In a large saucepan, fry the onion in the olive oil until tender. Add the garlic and mushrooms and cook until mushrooms are tender. Put the mixture into a blender and blend to a purée. Grind the chestnuts. Put them in a large bowl with the ground almonds, breadcrumbs, puréed mushrooms, soy sauce, lemon juice, tarragon and yeast extract and mix well. Roll the puff pastry out to a 15” square. Place the pastry onto a greased baking sheet and heap the mixture into the centre, forming a loaf shape. Make diagonal cuts in the pastry about 1cm apart on each side of the mixture, then fold these over the mix to make a kind of plait. Tuck the ends in neatly and trim off any extra bits. Bake for 40 minutes until pastry is puffed and golden brown.